Scandinavia and other countries on the northern hemisphere host some of the most exciting lake ecosystems of the world - the lobelia lakes. These lakes are typically crystal clear as the receive very few nutrients so algal growth is limited. The aquatic vegetation is primarily composed by isoetids, small plants represented by many different plant families but with similar morphology and a very exciting physiology. Some are CAM plants (a feature which is normally found in cacti) and for photosynthesis, they all utilize CO2 from the sediment to compensate for the carbonate-poor water surrounding them. 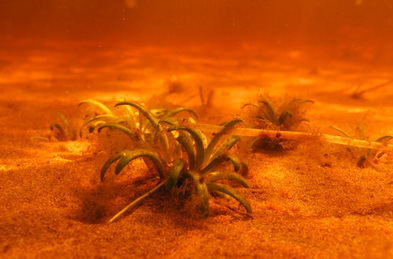 Lobelia dortmanna flowering under water in a pristine Norwegian lake. It is not known if the flower becomes self-pollinating but seeds develop in the capsule so it would be easy to test whether these are viable or not. Lobelia dortmanna suffering from lack of light due to brownification in Lake Värsjön, Southern Sweden. We have worked in this particular lake over the past 4 decades and so we have witnessed the deteriorating light climate in the lake. 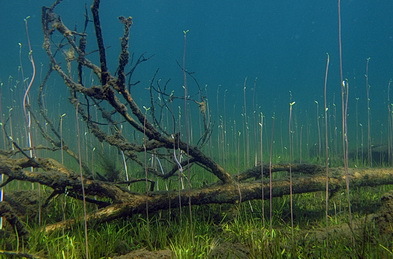 Brownification of lobelia lakes is a growing problem on the Northern Hemisphere, where humic substances formed in the terrestrial catchment is washed into pristine lakes. The colored dissolved organic matter (cDOM) absorbs light and greatly reduces the depth penetration of submerged aquatic plants including the slow-growing and ultra-sensitive isoetids e.g., Lobelia dortmanna, Littorella uniflora, Isoetes lacustris, I. echinospora and the rare Subularia aquatica. The mechanisms behind brownification are not yet fully understood and so management plans cannot be developed based upon scientific recommendations.